Matthew Amster-Burton was a restaurant critic and food writer long before he and his wife, Laurie, had Iris. Now he’s a full-time, stay-at-home dad, and his experience with food has changed . . . a little. 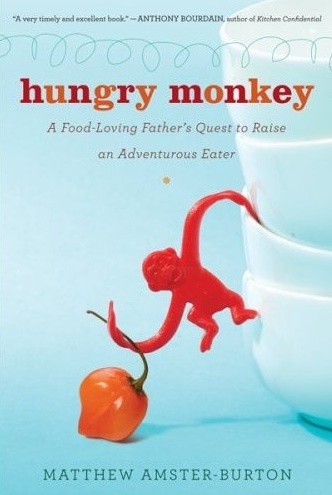 Hungry Monkey is the story of Amster-Burton’s life as a food lover — with a child. It’s the story of how he came to realize that kids don’t need purée in a jar or special menus at restaurants, and that raising an adventurous eater is about exposure, invention, and patience. He writes of the highs and lows of teaching your child about food — the high of rediscovering how something tastes for the first time through a child’s unflinching reaction, the low of thinking you have a precocious vegetable fiend on your hands only to discover that a child’s preferences change from day to day (and may take years to include vegetables again). Sharing in his culinary capers is little Iris, a budding gourmet and a zippy critic herself, who makes hug sandwiches, gobbles up hot chiles, and even helps around the kitchen sometimes. A memoir on the wild joys of food and parenting and the marvelous mélange of the two, Hungry Monkey takes food enthusiasts on a new adventure in eating, with dozens of delicious recipes. In the end, as Amster-Burton reminds us, "Food is fun, and you get to enjoy it three times a day, plus snacks!"